A record number of entries are set for this year's Race Retro Live Rally Stage, including a host of ex-works cars and motorsport legends celebrated. Those who did make it into the Parc Ferme include Chris Robson’s 1982 Citroen Visa UK ex-works rally car, the first purpose-built rally car to be homologated into Group B. The winner of the Up to 1300cc Class of the Pace/Autosport National Rally Championship and was runner-up in the Group B category of the Rothmans Open Rally Championship with John Weatherley at the wheel. EGN 78X was part of a two-car assault by Citroen UK on the Rothmans Manx International in 1983, driven by Konrad Bartelski, Britain’s most successful world cup downhill skier, with co-driver Neil Wilson, and sponsored by Penthouse Magazine. This car was runner up in the championship with a class win behind John Weatherley and Ronan Morgan in the later works Citroen Visa Chrono Evolution. 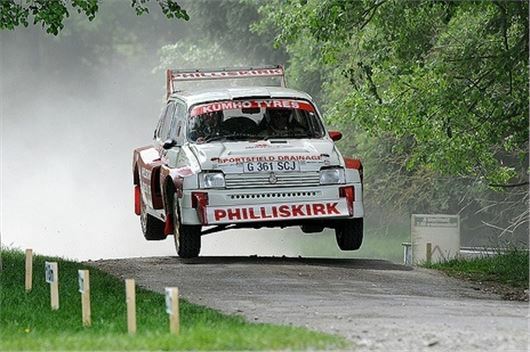 Warren Philliskirk’s crowd-thrilling 6R4 was built by John Price and won many tarmac rallies and championships in John’s very capable hands. Warren purchased the car in 1995 and has campaigned 62 rallies including the Icelandic Rally, winning five national rallies and the BTRDA championship in 1997. Ex-World Champion Juha Kankkunen’s 1999 World Rally Championship (WRC) winning Subaru will be in action. Now owned by Will Nicholls, it also won Rally Finland in 1999. Dave Kenwood’s ex-factory Opel Calibra 4x4 will also be on the startline. It was driven by ex-World Champion Stig Blomqvist on the 1993 round of the WRC. Other Championship cars include David Wright’s Ford Focus which was campaigned by Carlos Sainz and Petter Solberg during the 2000 WRC and secured its best WRC result on the Rallye Automobile de Monte-Carlo 2000 driven by Carlos to second overall. The Pilot Ford Cosworth, driven to victory by M-Sport boss Malcolm Wilson in the 1994 British Championship and now owned by George Gauld will also be in action. Other Fords include Clayton Parmenter’s factory M-Sport built development super Puma 1600, previously driven by ex-British champion Dai Llewellyn and current WRC works driver Kris Meeke; Michael Anderson’s Cosworth Ford Cosworth, an original Ford Motorsport France factory car was first used by Frederik Balaresque in the French Rally Championship before being reregistered as Spanish in the early 90s and campaigned by the late Juan Luis Sarasola.